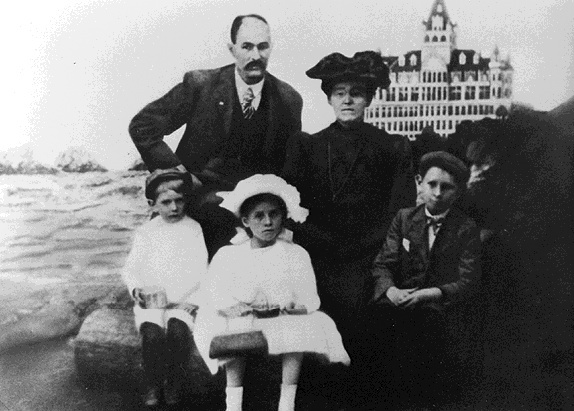 The Simmons Family in 1903 with the Cliff House in the background. This picture, which is the same one that is displayed at the end of Pier 39, was taken at the Cliff House around 1903. The family in the picture is the Simmons Family. They were long-time established residents of San Francisco. The oldest boy in the picture was Harold and the father of Margaret Simmons Brunhouse of San Jose and Warren Simmons of both Napa and Chile, South America. Warren created and developed Pier 39, and, also the Tia Maria and Chevy's Restaurants. Katherine, the little girl in the picture, later became the matriarch of the family and lived in the Sunset District until her death in 1983. She had two sons, Harold Warren Levitt (architect) who lives in Los Angeles and William Charles Putney who lives in Monarch Beach, South of Laguna Beach. Warren, the youngest child in the picture, had two children who still live in the city, Robert John Simmons and Marilyn Simmons Harmon. Harold Levitt and Margaret both graduated from Polytechnic and Warren, Marilyn, Robert and William from Lowell.